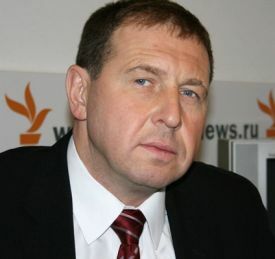 time Putin adviser Andrei Illarionov says that sooner or later - they will. "If large-scale military hostilities were to break out in which Russia were to fight a considerable portion of the modern world, it would most likely face a coalition of states whose combined military, economic and demographic strength would surpass Russian forces by at least 16-18 times. The outcome of such a confrontation is easy to forecast. Russia would be defeated and its economic, housing and infrastructure capacity utterly destroyed. The threat of mass starvation and epidemics would be great. On top of these losses, as has been shown in past world wars, the dead from this new conflict would run into the tens of millions. A significant portion of Russia would be occupied by foreign powers which would establish an occupation regime." Why should the Crimean Tatars have special authority over the fate of Crimea? What way is there (other than through a dictator) to ensure Crimea's return to Ukraine? To begin with we should remind ourselves of the earlier principle of who precisely has final authority to determine territorial jurisdiction over Crimea: The question of the ownership of Crimea can be determined by only one subject of international law - the owner of the territory. The owner of the Crimean peninsula is the state of Ukraine. This and only this entity has the authority in the area to change the affiliation of this territory. "Indigenous peoples have the right to freely determine their own political status and purse their choices of economic, social and cultural activities." Komsomolskaya Pravda, Russia: Russia's Dissolution Over Ukraine War? ... Ridiculous! Indigenous peoples are defined as people who inhabited lands before the formation of existing state borders and the arrival of migrants from other areas. The indigenous peoples of the Crimean peninsula, who have no homeland outside this territory, are Crimean Tatars, Krymchaks and Crimean Karaites. The Greeks, Genoese, Jews, Armenians, Russians, Ukrainians, Germans and other modern peoples, representatives of which at one time settled in Crimea, have their own homelands outside this territory. The three indigenous peoples of Crimea do not. Third, in less than two centuries, the ethnic structure of the population of Crimean has radically changed. The indigenous people of the peninsula - the Crimean Tatars - have been subjected at least three times to the mass repression of their ethnic and religious beliefs. Prior to Russia's 1783 annexation of Crimea, the Crimean Khanate [vassal state of the Ottoman Empire] was essentially a mono-ethnic state. The Crimean Tatars were an absolute majority on the peninsula until 1864 (over 50 percent) and were a significant ethnic minority until the end of the 19th century (around 36 percent in 1897). For about a century and a half (from 1783 to 1944), the Crimean Tatars have experienced three demographic catastrophes: after the unification of Crimea with Russia (1780s-1790s), after the Crimean War (1850s-1860s) and May 18-20, 1944. As a result of the first demographic catastrophe (genocide and emigration) the Crimean Tatar population in Crimea was reduced by 75 percent; after the second emigration following the Crimean War it was cut in half again, and during the third (the deportations of May 18-20, 1944) almost the entire population of Crimean Tatars was forcibly deported to Uzbekistan and Kazakhstan. According to various estimates, the death rate during the deportations and upon arrival in their new settlements was between 25 and 46 percent. The second half of the 1980s saw the Crimean Tatars begin to return to their historic homeland. According to the 2001 census there were 248,000 Tatars in Crimea (in Crimea Republic and Sevastopol combined), or roughly half as many as lived on the peninsula three centuries before, at the beginning of the 17th century. Given the natural and immigration-related population growth among Crimean Tatars, their numbers grew to approximately 300,000 at the beginning of 2014, or roughly 12 percent of Crimea's total population. The ethnic Russian population, which was virtually non-existent in Crimea until the end of the 18th century, increased their presence on the peninsula to almost 1.5 million over the following two centuries. Over a million either moved to Crimea or are descendants of people who immigrated there after the deportation of the Crimean Tatars in 1944. Considering the tragic fate of the Crimean Tatars, taking into account their lack of a national home outside the peninsula, based on the U.N. Declaration of the Rights of Indigenous Peoples, I suggest that these people are entitled to the additional authority to determine the fate of Crimea. 2. 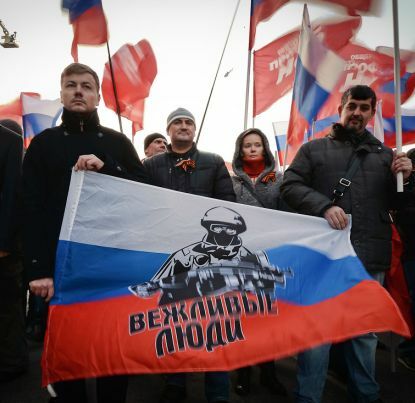 When will Russians themselves want to hand Crimea back to Ukraine? The following is a possible timeline of events. With its aggression against Ukraine, its occupation and annexation of Crimea and the war in east Ukraine, the Putin regime has destroyed the foundations of the international order in Europe which has existed since the end of World War II. The Kremlin’s aggressive intentions have, alas, not diminished. Furthermore, there are clear signs of growing preparations for a large-scale, tough, and protracted confrontation with the outside world amounting not only to another Cold War, but a full-blown hot war. During the First and Second World Wars, the aggressor-countries who were at the center of military conflict (Germany in both wars, Austro-Hungary, Russia, the USSR) sustained enormous devastation, suffered huge military losses and civilian casualties amounting to tens of millions. The number of victims ranged between 10 to 15 percent of the pre-war populations in these countries. With the development of military technology the destructive power of weaponry has risen dramatically. If large-scale military hostilities were to break out in which Russia were to fight a considerable portion of the modern world, it would most likely face a coalition of states whose combined military, economic and demographic strength would surpass Russian forces by at least 16-18 times. The outcome of such a confrontation is easy to forecast. Russia would be defeated and its economic, housing and infrastructure capacity utterly destroyed. Supplies of electricity, water and gas would be suspended in large portions of its territory. The threat of mass starvation and epidemics would be great. On top of these losses, as has been shown in past world wars, the dead from this new conflict would run into the tens of millions. A significant portion of Russia would be occupied by foreign powers which would establish an occupation regime. At the end of the war, the victorious powers would take steps to prevent the restoration of the material foundations of Russian militarism, chauvinism and aggression. To this end Russia could be obliged to pay reparations and compensation to the victims of Russian aggression. In part to ensure these commitments, some of the current territory of Russia which historically belonged to neighboring states and was subsequently annexed could be returned. Territories could be handed over which from time to time have been subject to public and private claims from abroad: For example, Pytalovskiy Oblast could be returned to Latvia; the Kingiseppsky District of Leningrad Oblast to Estonia; the north Karelian Isthmus, Prionezhsky District and Pechenga to Finland; Kaliningrad (aka/East Prussia) to Germany; Smolensk and Bryansk Oblasts to Belarus; Belgorodsk, Kursk, Voronezhsk and Rostovsk Oblasts and Krasnodar Krai to Ukraine; the Omsk steppes to Kazakhstan; at least 1.5 million square kilometers of Siberia and the Far East to China; and the Kurile and Sakhalin Islands to Japan. Oil and gas reserves, a network of long-distance pipelines and the banking system – which has been the basis of the government's aggressive economic policies could be given up to international control. It’s possible that Russia will not end up going experiencing everything described above if the overwhelming majority of Russian citizens, having survived the military conflict and the resulting political, economic and demographic catastrophe, sincerely supported the intention of the provisional government [or otherwise force it] to quickly and quietly return the Crimean peninsula to its undisputed owner - brotherly Ukraine - and restore normal diplomatic, economic and personal relationships. This would be the first step to take in reviving Russian society after such a monstrous disaster. Of course this is only one of a number of possible unpleasant scenarios for Russia and her neighbors. Much more advantageous for Russia would be a conscious and voluntary return of Crimea to Ukraine before these scenarios come to pass. *Andrey Illarionov is a former economic policy advisor to Russian President Vladimir Putin. He is now with The CATO Institute in Washington.